I need a Twelve-Step Program for my addiction to dishes. Yes, you read it correctly. I am obsessed with dishes. Not the commemorative type that people buy to remember special occasions or unique places. I can’t seem to own enough dinner plates, salad bowls, 16-piece dinnerware sets. As my generation was growing up, it was readily accepted that blame for everything unpleasant about yourself be placed on your parents. As I see it, my mother really is to blame for my out-of-control dish fetish. We were a little family, just the three of us, but that never stopped my mother from making a big deal about meals. Every night we ate dinner on an artfully set table complete with candles. She owned just one set of everyday dishes but she mixed and matched those basically white dishes with solid black bowls and salad plates, different placemats, and candles. Our table looked remarkably different, each night, even though it was set with essentially the same dinnerware. My father was no help. Delighting in the dinner atmosphere that she created, he did irrational things to support her. One day, he sanded and painted three inexpensive, wooden, salt and pepper shakers so she would have some additional touches of color on the table. As you can see, I was doomed from the very beginning. When you’re a teenager, you don’t really want to be like your parents but I recognized, early on, that I’d be wise to emulate many of my mom’s personal traits. She loved to spend time with friends, had a definite sense of style, and a genuine ease with entertaining. I never seemed to develop her sense of table style or her genuine ease at entertaining. But I loved my friends and somewhere along the way, I must have decided that I could make up for what I was lacking, in the hostess department, with a substantial collection of dishes. I bet even Perle Mesta, the hostess with the mostess, didn’t own as many dishes as I do. So, my journey down this road of dish acquisition began. To my first, simple set of white, everyday dishes, I added sets that matched the accent colors in my apartment. From there, I moved to thematic dishes…after all, what says yummy breakfast better than a chicken running across your plate? Eventually, holiday dishes joined the collection. Christmas dishes had become quite popular and were easy to find. I’ll probably have a harder time finding Ground Hog’s Day dishes. Meanwhile, my friends think I’m crazy. Luckily, they haven’t tried a group intervention. My friend, Judy relentlessly asks me when she will be receiving an invitation for dinner. “Roger and I are so looking forward to coming to dinner,” she’ll exclaim, “we can’t wait to eat from lobster dishes and use those matching lobster crackers.” I know she’s just taunting me. And she doesn’t have a clue how long I searched for a set of lobster dishes that coordinated with those red metal lobster pinchers. Nobody really understands. 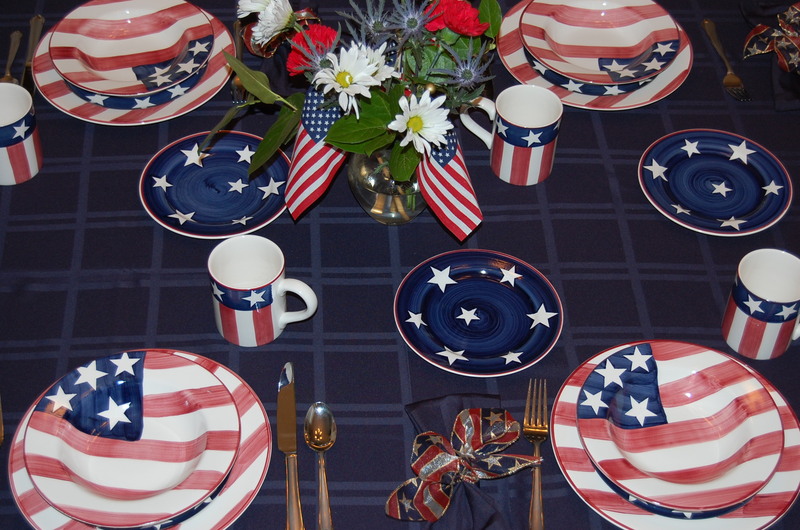 As we head toward Independence Day, I thought it might be appropriate, for a blog on celebrations, to feature a picture of a festively set table highlighting my Fourth of July dishes. Aren’t they just the cutest… with their little pointed stars and subtle red stripes? I’ll be enjoying them for the entire month. Then, I’ll pack them away knowing I won’t see them again for another year. The only thing that will keep me from shedding tears is the fact that the black dishes with the pumpkins will be out in just 92 more days.